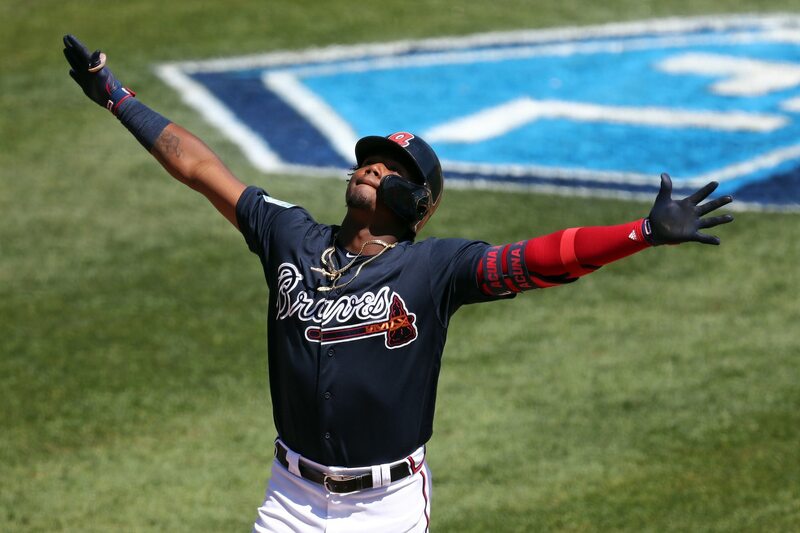 The Atlanta Braves announced on Tuesday that they had agreed to a contract extension with reigning National League Rookie of the Year Ronald Acuna Jr. The deal will pay Acuna a minimum of $100 million through 2026. Atlanta also has $17 million club options for the 2027 and 2028 seasons. For the Braves it’s a great deal: For anyone hoping for labor peace and for eventual work stoppage to be avoided? Not so much. First things first, yes, this is a record deal for someone with as little service time as Acuna has. Still, this actually leaves even a worse taste than the deal that Eloy Jimenez signed the Chicago White Sox, which was a record for players who hadn’t yet debuted in the majors. When Jimenez signed that deal, we were pretty sure that he’d be making far below his market value by the time the deal was up. With Acuna, there’s even less doubt. Jimenez has incredible potential. But Acuna is already an MLB star. We’re talking about a guy who hit .293/.366/.552 with 26 home runs and 14 steals as a 20-year-old rookie. Even that came in a season in which he played only 111 games and took 433 at-bats. The prime years of baseball players generally come in their mid-late 20s. Assuming the Braves pick up those team options (which barring a drastic change is an incredibly safe bet), Acuna won’t be a free agent until he’s 30. He’s not going to sign for the same kind of money that someone at 26 or 27 would. And that really gets us to the meat of the problem. When Bryce Harper signed his deal, he had true options. He could have made far more money per year with the Los Angeles Dodgers, but opted for the long-term stability that the Philadelphia Phillies offered. It was his choice to do so. Therefore, even if you would have done something else, it’s kind of hard to say that Harper got a bad deal. He made a choice. With Acuna, though, the “choice” was much different: That’s because MLB’s pay structure — at least as it relates to players on their rookie deals — is badly broken. Acuna could have gone through the rookie contract and become a free agent in 2024. But to do so would have meant going through years of team control. In layman’s terms, team control means paying young players peanuts compared to what older players are making. For reference, Juan Soto, Acuna’s fellow 2018 rookie phenom, is making only $578,300. Acuna will be making just short of 30 times that at the end of his current deal and will still be underpaid. The contract that Acuna just signed is well under his market value. But it’s still a tremendous amount of money, especially for a 21-year-old kid from Venezuela. That really gets us to the root of the problem: And it’s where the labor unrest is a real threat. There’s no way that the union wants to see someone like Acuna signing a deal like this. On the other hand, teams have seen contracts get out of hand (in their eyes, anyway) and have constantly looked for ways around that. The early years of a player’s career are when his team has, by far, the most control. Once a player reaches the arbitration years and certainly free agency, things change. The union will no doubt want the team control years significantly modified — and that’s putting it mildly. It will give guys like Acuna more of a real choice on deals like this one. Teams will unquestionably fight that. And no, this isn’t a doomsday prophecy. There are compromises. They just won’t be easy to find and certainly won’t be easily reached. Contracts like this are done for long-term stability. But from an overall standpoint, it can do the exact opposite. We can’t fault Acuna for signing the deal by any means. But the fact that it essentially had to be signed makes significant labor unrest a very real possibility.